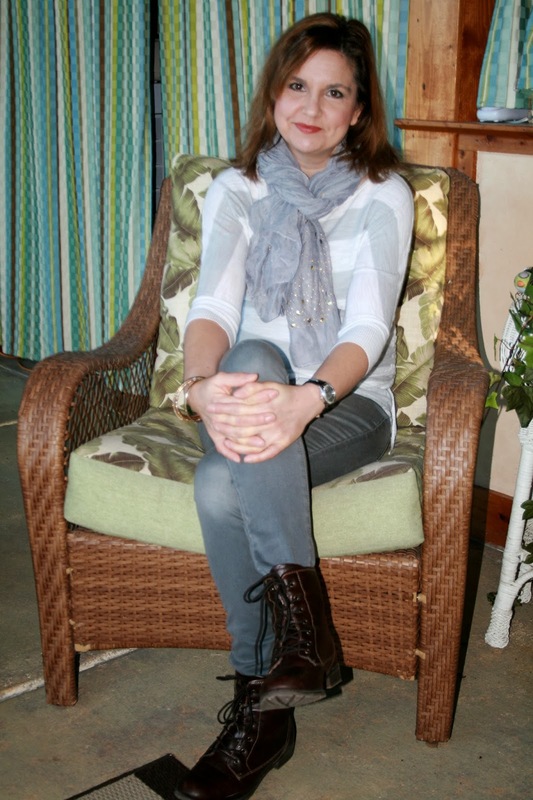 Amy's Creative Pursuits: Fashion Over Fifty: What is YOUR Fashion Style? I really LOVE this scarf and I would wear it in a heartbeat. 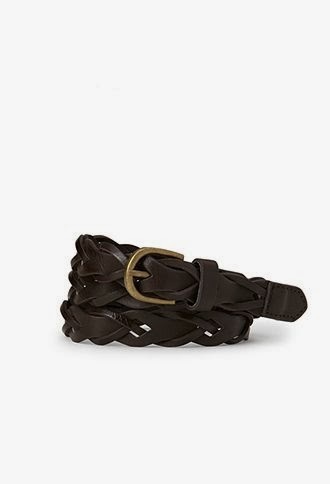 And with the right outfit, I would definitely wear either one of these belts. This is the new fanny pack for the new generation. I would love to try one on my next vacation! 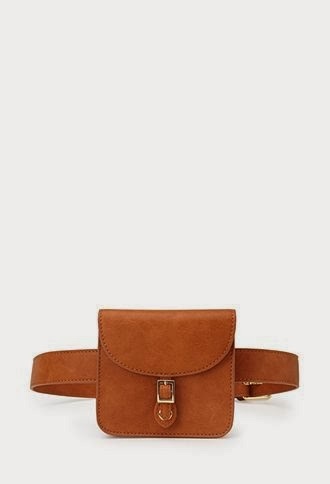 Much more stylish than the black nylon fanny packs of my generation! LOL! 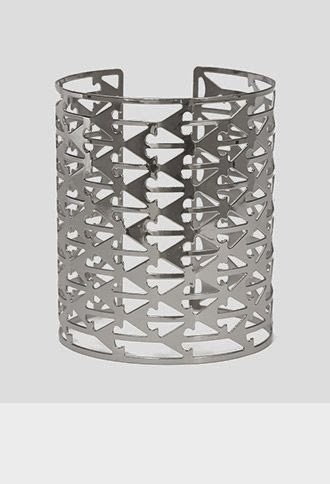 Next to the fanny pack is an arrow cutout cuff bracelet. If in the right mood, I would really like to wear this! I find the lace boots so unusual and I love the feminine touch to an otherwise masculine style of shoe. 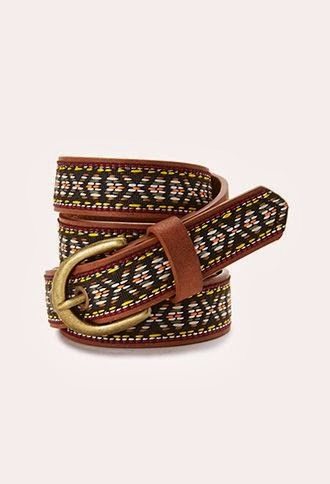 The floral belt is so pretty, and would be such a nice finishing touch to a spring outfit, and the scarf is just such a neutral, go-with-anything item. But even though I liked a lot of individual pieces in this collection and I would wear them, I determined overall it wasn't my style. It seems a little too youthful for me. The third style is The Minimalist and I found it was totally, totally me. I think I pinned almost everything from this style group. And I found it interesting that just like my cards and design style (which I prefer clean and simple), that is also how I like my fashion. It is described as "Neutral tones, Minimalist Metals, and Sleek Lines for the Modern Muse. " Gees, even the description describes my personality! I really don't think there is one thing in this collection that I would not wear except for the Jet Black nail polish or the stilettos. My reason for not wearing the black nail polish is obvious, but as for heels, I'm just too old for them…they are uncomfortable and as I've said many times before, in my twilight years, I'm all about comfort. However, I would wear these black shoes. 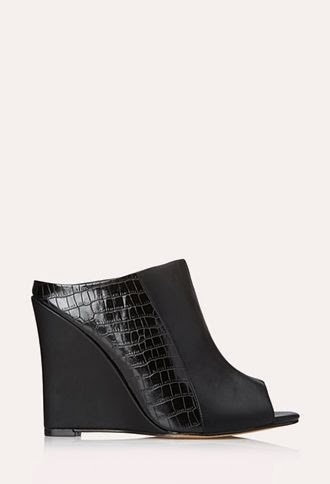 I love wedges, for they give you the lift and elegance of a heel, but you can still walk in them! I adore this quilted handbag. 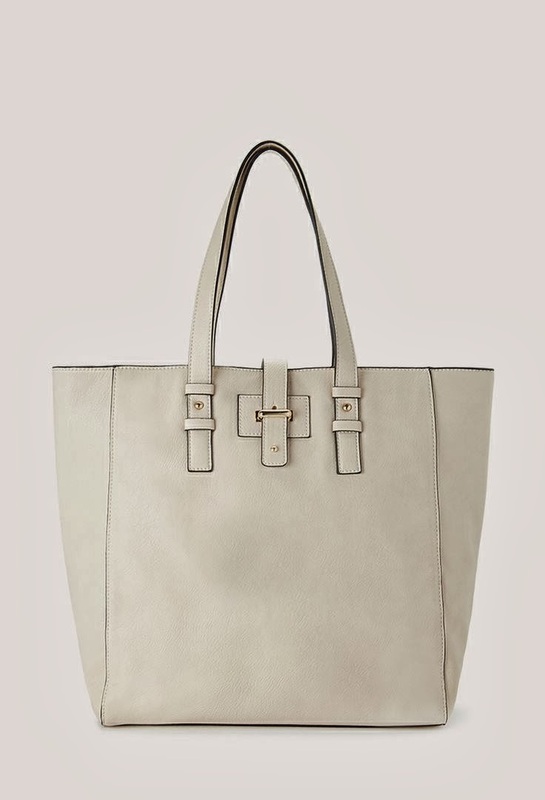 Anything quilted is so 'in' right now, and it would be the perfect neutral handbag for spring. These sunglasses are so chic! And out of all the jewelry pieces, this one was my favorite! Love the modernist look! 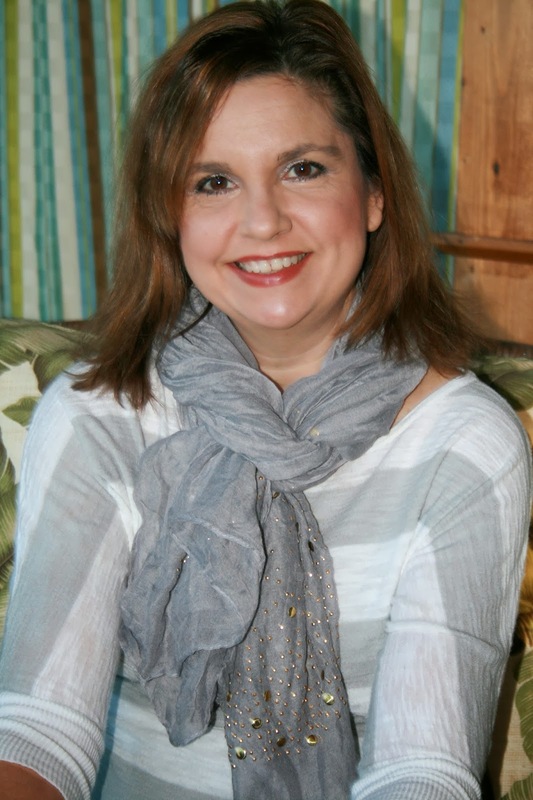 I had to chuckle at how I was drawn to another grey striped scarf in this collection that is similar to the grey striped scarf in the Free Spirit collection. But when I look closely at the pieces I like in this collection, they are very classic and minimalist also….just what I like and totally me! I have to chuckle that with the exception of the shoes, the entire outfit is shades of grey and/or neutrals. The top is from Express and is several years old. It is a sheer knit top with a tie on the side. I wore a grey lace cami underneath. The pants, believe it or not, I bought on clearance at Target for about $7.00 (similar pants HERE). I find the story of these pants absolutely hysterical because on that day I went to our local mall and visited every store in the mall for a pair of grey pants and I couldn't find any that were in my size, my price range, or that I liked. I finally gave up and went to Target to buy groceries. While there I saw all their clearance clothing racks and decided to take a peek. Now, I know a lot of people love Target clothes, but I rarely buy their clothes because I don't like the quality, but I loved the look and feel of these pants, so I decided to try them on. I was absolutely shocked! They not only fit like a glove, but they were so comfortable too! And for only $7.00 too! It was my lucky day! 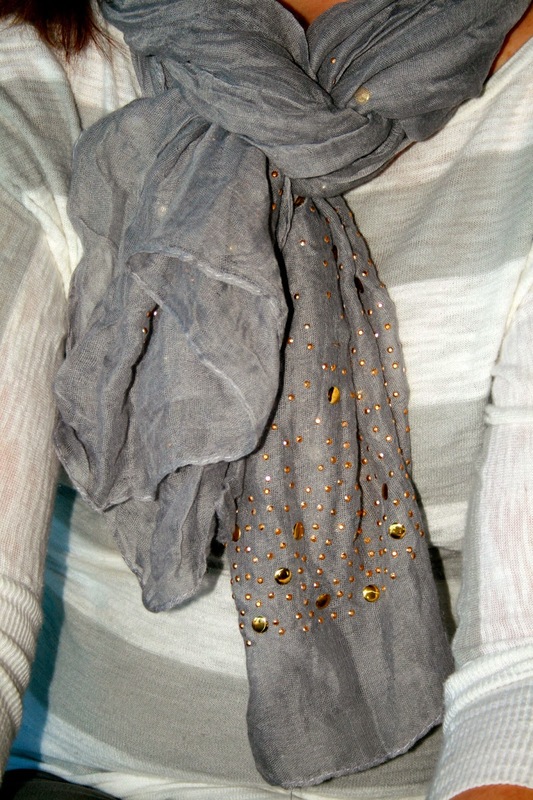 I accented my grey stripe shirt with a solid grey gauze scarf that has these really neat gold studs on it. I think I got the scarf from Charming Charlies, but I really don't remember. Sorry. I know a lot of people love this scarf and every time I wear it someone inevitably asks me where I bought it, and I usually remember those details, but because I own enough scarves to clothe a small country, I'm starting to forget when and where I bought them! 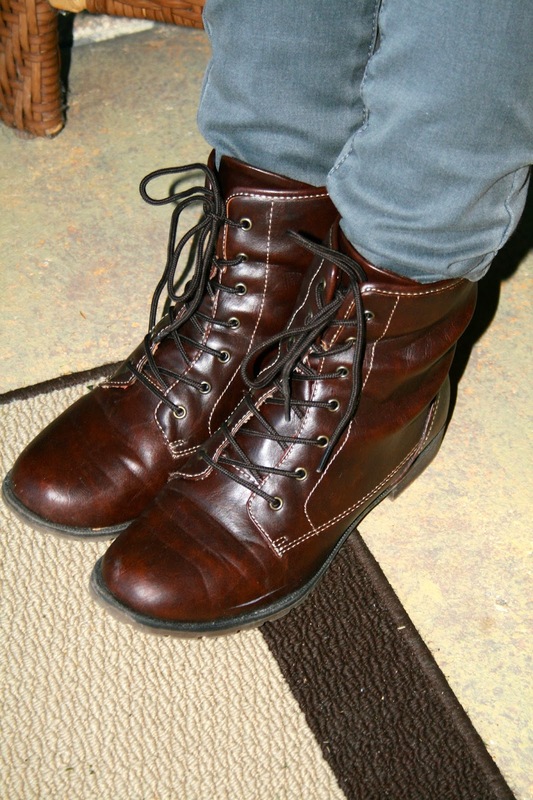 For shoes, I wore my favorite combat boots from Famous Footwear. They are so warm and toasty and most importantly SAFE to walk in on our very icy sidewalks and streets in Northern Wisconsin. 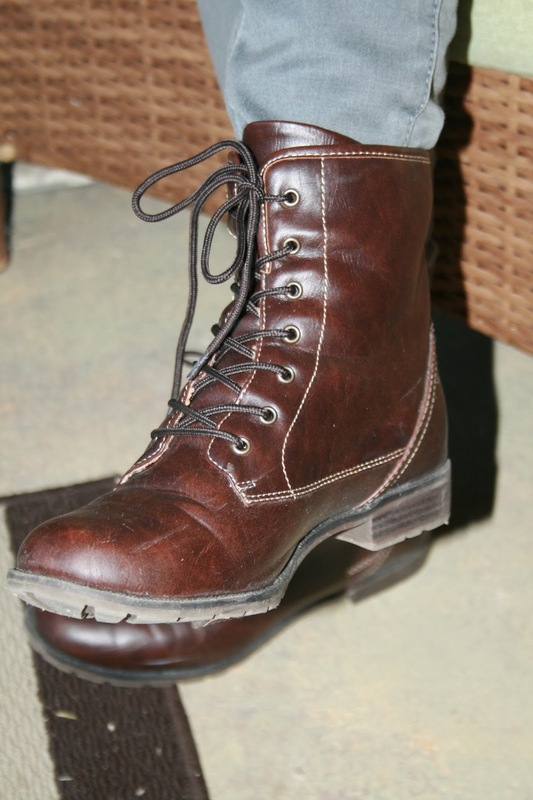 I recently read on another blog that implied that combat boots are a more youthful look for younger girls, and I replied to that blogger that I wear them because they are good, practical, safe, warm boots. So I'm sorry if the younger generation thinks I look silly wearing combat boots, but, my feet tell me otherwise! 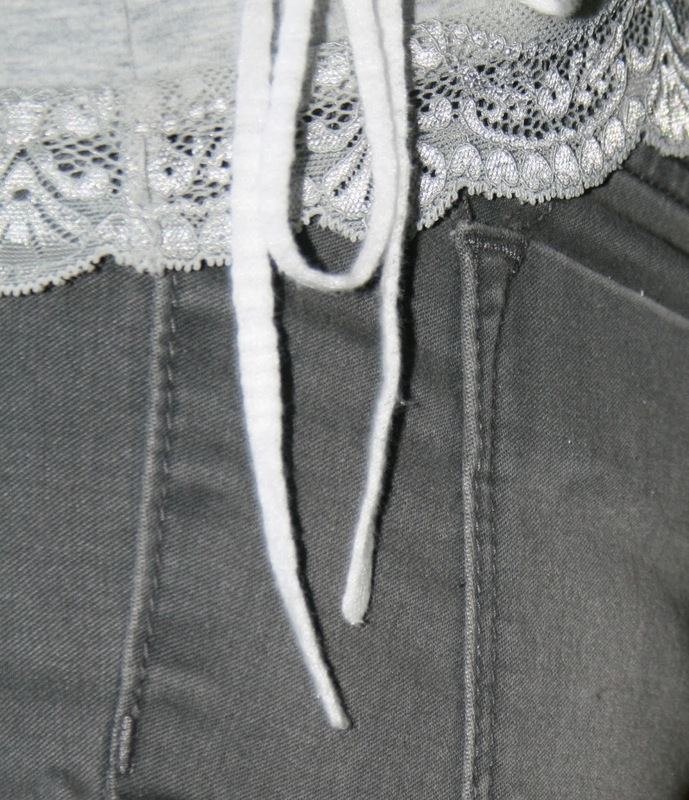 And finally, here is a close up of the grey denim jeans, the lace detail in the camisole, and the tie of the striped shirt. I really love the wash in this pair of denim. It looks slightly worn, like I've had these pants for years, and they are so soft to the touch. So what about you? What is YOUR Fashion Style? Are you definitely one style, or are you a mix of everything? I'd love to hear your thoughts. Your outfit is adorable and you look 20 years younger than you are. Seriously. Forever 21 has the best accessories. I never leave there empty handed. Will have to check out Forever 21. I don't think I have actually ever been in one of their stores. I was on the 'Forever 21' site last night. I think I have two styles, and I choose one or the other depending on my mood. It is a tug a war between minimalist and free spirit.